Lise Meitner (1878-1968) was one of the great woman scientists of the 20th century. A pioneer of radioactivity and nuclear physics and the first female professor of physics in Germany, she discovered Protactinium and nuclear fission. She features in lists of distinguished women scientists as a physicist who deserved the Nobel prize and who never lost her humanity. Beyond that, what does her life tell us about women in contemporary science? What general lessons can be drawn from her career? 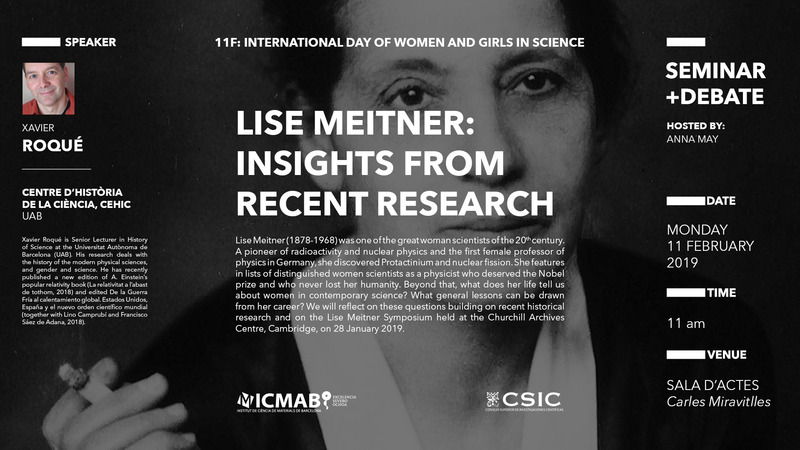 We will reflect on these questions building on recent historical research and on the Lise Meitner Symposium held at the Churchill Archives Centre, Cambridge, on 28 January 2019. Xavier Roqué is Senior Lecturer in History of Science at the Universitat Autònoma de Barcelona (UAB). His research deals with the history of the modern physical sciences, and gender and science. He has recently published a new edition of A. Einstein's popular relativity book (La relativitat a l'abast de tothom, 2018) and edited De la Guerra Fría al calentamiento global. Estados Unidos, España y el nuevo orden científico mundial (together with Lino Camprubí and Francisco Sáez de Adana, 2018).